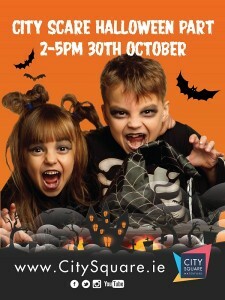 Halloween seems to be getting bigger every year and we have a real treat in store with our City Scare Party on Bank Holiday Monday 30th October from 2-5pm. All the children are invited to come along and get their faces painted before getting a free photo at the selfie mirror. Plus there will be giant Halloween characters patrolling the malls who will lead the fancy dress parade and give out lots of little treats. Our DJ will blast out the latest hits as well playing games with prizes to be won.